On a bright Phoenix morning, Elena Santiago opened her door to find her house surrounded by a platoon of federal immigration agents. Her children screamed as the officers handcuffed her and drove her away. Within hours, she was deported to the rough border town of Nogales, Sonora, with nothing but the clothes on her back. Her two-year-old daughter and fifteen-year-old son, both American citizens, were taken by the state of Arizona and consigned to foster care. Their mother’s only offense: living undocumented in the United States. Immigrants like Elena, who’ve lived in the United States for years, are being detained and deported at unprecedented rates. Thousands languish in detention centers—often torn from their families—for months or even years. Deportees are returned to violent Central American nations or unceremoniously dropped off in dangerous Mexican border towns. Despite the dangers of the desert crossing, many immigrants will slip across the border again, stopping at nothing to get home to their children. Drawing on years of reporting in the Arizona-Mexico borderlands, journalist Margaret Regan tells their poignant stories. Inside the massive Eloy Detention Center, a for-profit private prison in Arizona, she meets detainee Yolanda Fontes, a mother separated from her three small children. In a Nogales soup kitchen, deportee Gustavo Sanchez, a young father who’d lived in Phoenix since the age of eight, agonizes about the risks of the journey back. Regan demonstrates how increasingly draconian detention and deportation policies have broadened police powers, while enriching a private prison industry whose profits are derived from human suffering. She also documents the rise of resistance, profiling activists and young immigrant “Dreamers” who are fighting for the rights of the undocumented. 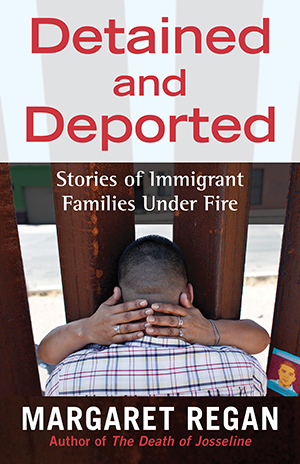 Compelling and heart-wrenching, Detained and Deported offers a rare glimpse into the lives of people ensnared in America’s immigration dragnet. Yolanda Fontes sat in her prison scrubs and watched the families gathered all around her. Husbands were reconnecting with wives, sisters with sisters, mothers with children. It was a sunny Sunday in April, and the families had flocked to the Eloy Detention Center, a dreary for-profit immigration prison in rural Arizona, to visit their detained loved ones. A female prisoner sat with her small son on her lap, her arms wrapped tightly around him, as if she were imagining never letting him go. The aunt who had brought the little boy spoke sorrowfully to her sister as the child snuggled in his mother’s embrace. Nearby, an imprisoned father sat across a table from his wife, clutching her hand. They were trying to talk, but their four-year-old daughter, hungry and tired, fussed on the floor below. None of the families in the packed room had any privacy. An impassive guard presided over their melancholy reunions, keeping a close watch on the mothers and fathers dressed in jailbird scrubs. The visiting room was bleak and windowless, lit by glaring prison lights. It was a beautiful spring day outside, but no rays of sunlight pierced its cinder block walls. Alone among the detainees in this stark space, Yolanda had no family visiting, just me, a writer who had come to hear her story. She was glad to be out of her prison unit, and she was full of smiles, determined to be cheerful. Yet her tale was grim, and she looked at the other detainees’ kids wistfully as she recounted it. During the two years she’d spent locked up in Eloy, she’d seen her two little girls and her little boy only sporadically. The children, all American citizens, lived in a distant suburb northwest of Phoenix. They came to visit their mom only when a relative or friend could spare the time to drive the two-hundred-mile round trip to Eloy. The last time Yolanda had seen them was two months before. Yolanda was thirty-two. She’d slipped into Arizona from Mexico seventeen years before, when she was just fifteen. She spoke flawless English and, even though she had no papers, she’d almost never had any difficulty finding a job. And until two years ago, she’d never had trouble with immigration. But the father of her two younger children regularly beat her, and one attack triggered a series of disasters that eventually landed her in jail and now detention. a judge to overturn the deportation order, praying to get back to her daughters and her son. Yolanda’s spirits flagged just once during the two hours we talked. The last time the kids came to see her, she said, her five-year-old, Little V, had looked at her suspiciously. “He told me I didn’t look like his mother,” she said, her eyes filling with tears. Her own child was starting to forget her. deportees eating a hearty breakfast of beans and rice in a humble dining hall run by an order of Mexican nuns. Like Yolanda, Gustavo had moved with his family from Mexico to the United States as a child. Born in Veracruz, he’d come to Phoenix at the age of eight and lived there ever since. He spoke perfect English. He and his wife had two small children, a boy of four and a baby girl, both of them US citizens. Gustavo had been arrested in Phoenix for riding his bicycle at night without a light and then detained by ICE. He’d rotated through several detention centers, in Arizona and in Colorado, before being tossed back over the border into Nogales. He’d always worked hard to support his children. What was their mother doing now, he wondered, without his wages coming in?